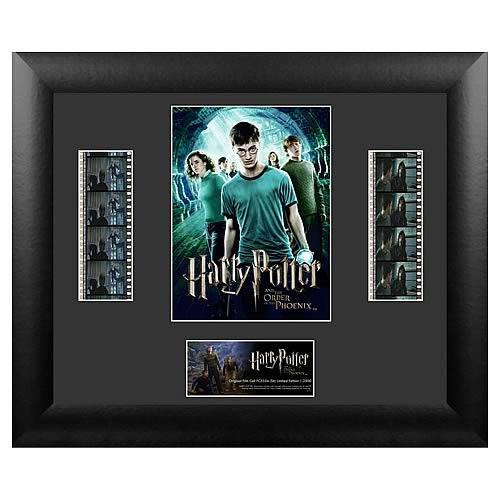 Features a print and actual cells of film from Harry Potter and the Order of the Phoenix! This amazing series 6 double film cell features prints and actual cells from Harry Potter and the Order of the Phoenix. Measures 13-inches wide x 11-inches tall. Perfect for displaying in your home or at the office, all the elements are framed in black wood and includes a certificate of authenticity. Order yours today! Ages 13 and up. Harry returns for his fifth year at Hogwarts to find that the new, Ministry-appointed Defense Against the Dark Arts professor, Dolores Umbridge, plans to teach only theoretical defensive magic. Harry secretly trains a group of fellow students - "Dumbledore's Army" - in defensive magic for the battle that lies ahead against the Dark forces threatening the wizarding community.